An abbreviation (from Latin brevi³re → brevis meaning “short”) is a shortened form of a word or phrase used mainly in writing to represent the complete form. It usually has a full-stop at the end. An acronym (from Latin acro- meaning “beginning” + -onym meaning “word, name”) is a pronounceable word formed mostly (but not always) from the initial letters of a descriptive name or title. The term initialism uses a similar method, but the word is pronounced letter by letter. Example: BBC British Broadcasting Corporation or USA United States of America. And last but not least, there are symbols and/or units of reference, like min for minute or kg for kilogram. 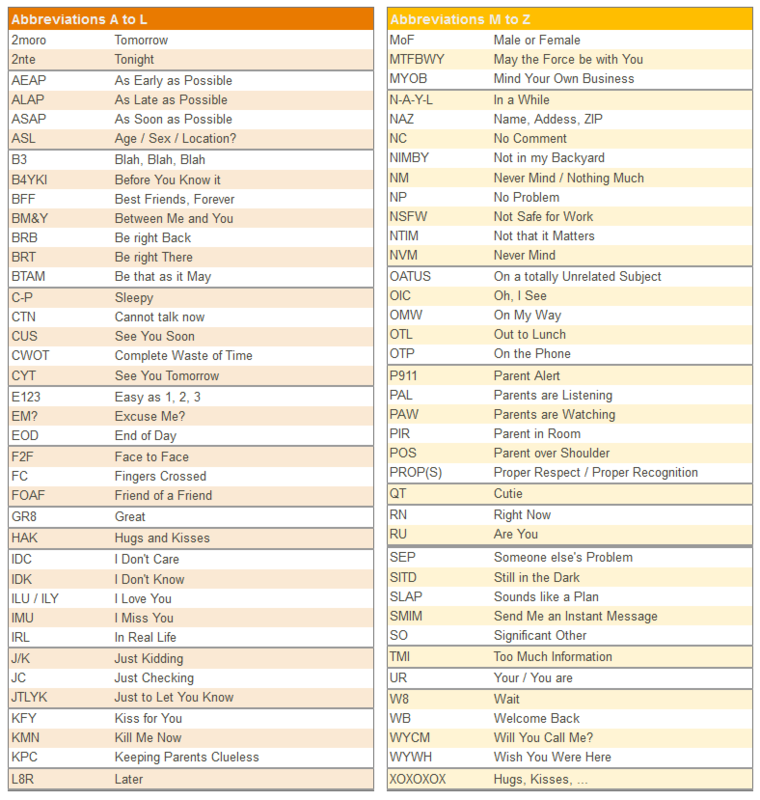 The Language of Internet: the following is a list of some common acronyms that are used on the web, in E-Mails,... . The list is far from being complete, it just contains the abbreviations (new Slang / shorthands), which I consider most useful. And they should help to better understand the meaning of text centered messages. The acronyms / abbreviations are mostly written in upper case. The reason is that these abbreviations are based on the pronunciation of their corresponding letter / digit. Please note: An acronym (from Greek: -acro = sharp, pointed; -onym = name) in its pure form denotes a combination of letters (usually from an abbreviation) which can be used and pronounced as a word. For the sake of clarity and readability, this definition is not always followed within the 2 lists on this page. If you are a newbie to the Internet or texting on your mobile phone you easily get confused by all the abbreviations, text shortcuts and acronyms used by more experienced users. 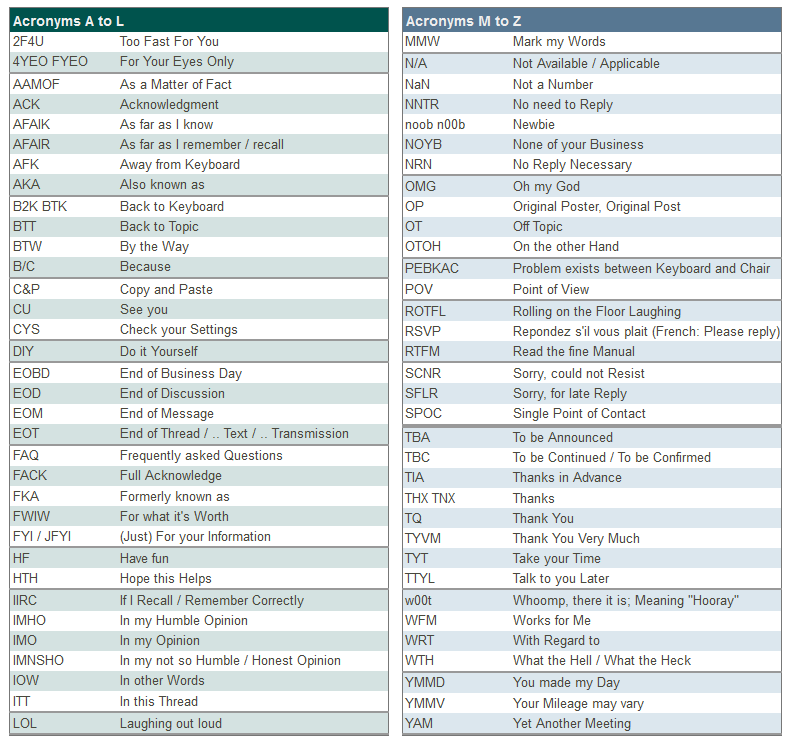 To help you out, this list contains a compilation of the 50 most common abbreviations utilized in text messages, IMs (= Instant Message), social networks, etc, where people want (or are required) to use only a few typed characters to communicate a thought or an idea . Please note: even though the acronyms below are written in ALL CAPS, it is not mandatory to use the capital letters, and most people tend to mix upper- and lowercase depending on personal taste. To use caps for the acronyms themselves is generally not considered poor netiquette; however, writing whole words or sentences in ALL CAPS is usually read as "shouting", and thus easily considered offensive.